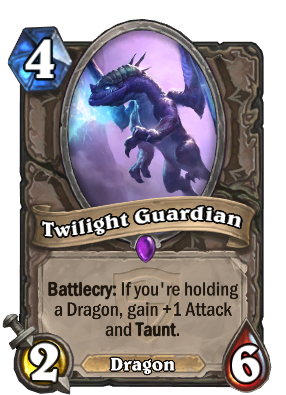 How good is twilight guardian? This card is the real MVP of dragon decks. Stronger than Twilight Drake? You might wanna put both in a dragon deck. No room for piloted shredder? 9 points of stats with taunt for 4 mana... this is power creep. fen creeper -1 mana + dragon synergy. patron warrior was a huge problem yes. so they make chillmaw and that was a good answer to that yes. adding this OP dragon on top of that? i understand epic cards are supposed to be good and this was probably supposed to be an anti-shredder (which was power creep in its own right, literally 6 mana card for 4 mana) so at what point does it stop? do you say this is the end point because it dies to the best 4 mana single target spell Fireball? do you make 6 attack 4 mana creatures so this has at least something it trades 1 for 1 with? we just keep progressing further and further with virtually guaranteed 2-for-1 creatures that keep getting bigger, eventually we are going to have things like loxodon smiter or phyrexian obliterator that are just above the curve and have no drawbacks. its just scary we are already getting to that point 2 full and 2 mini expansions into hearthstone. Not powercreep because the stats aren't guaranteed. If you don't have a dragon in hand, it's a worse Oasis Snapjaw. obliterator has the drawback of costing 4 black. you must not have been playing long enough to understand that this is forced into a dragon deck as oasis snapjaw beats this out if you don't have a dragon in hand. even in a dragon deck you still need to draw the dragon which is doable but this is also something that can get silenced and your opponent will then leave your 2/6 to do nothing as they pummel you. also you did point out a weakness. it is not a power creep but as new cards come out the beat out certain old cards. with a dragon in hand this is a better sen'jin shieldmasta and without is a worse oasis snapjaw. it is good for a 4 mana card and it's sligtly above average stats if the battlecry is met makes it worthy of it's rarity. Finally i can ditch the belchers.. This card is exactly, and I mean exactly, what dragon decks needed. This is to dragon decks what Shielded Minibot is to Paladin. Whoever designed this card deserves a raise. But will it be enough to make dragon decks competitive? I guess we'll have our answer soon enough. I hardly think whoever designed this card needs a raise since it's an epic one, therefore it's a spending magnet to get as many packs as necessary in order to find it, or to get the dust for it. Exactly because you need it for good dragon decks, even with the existence of Wyrmrest Agent. Spare me the childish troll patronising - you don't know anything whatsoever about me & I would expect to be treated in the same civil manner that I treat everybody else here & elsewhere. I have started seeing quite a lot of dragon priests after TGT, and while most of them lost, this card definitely greatly popularized dragon decks, there is no doubt about that. This card is so well designed for where Dragon decks are at. After looking through all the cards, I think this is the one I want most. Must save 800 dust. Heed my warning and don't have high hope on this card. The dragon-in-hand requirement is not something you can mess up with. Unless you constantly have very large dragons jammed in your hand, all these dragon battlecries only have very small chance to take effect. The deck must be fiendishly slow for this card to work properly.